Hot sun making you work up a sweat? A frozen concoction made in your Margaritaville® Bali™ Frozen Concoction Maker® with Self Dispenser is just what you need to stay cool. Freshly shaved ice and delicious island flavors mixed with your favorite liquor will transport you to cool island beaches with just one sip. A twist of lime will make anything more refreshing - and the juicy citrus fruit is the star of this sparkling frozen concoction that's guaranteed to lower the temperature. Vodka and seltzer mixed with just a hint of sweet agave nectar creates a subtly sweet frozen concoction that will cool you off in no time. Mix all ingredients together in your Margaritaville® Bali™ Frozen Concoction Maker® with Self Dispenser. Provide tall glasses garnished with sugar and a lime wedge so you and your friends can help yourselves to this deliciously refreshing frozen concoction. Veggies in a frozen concoction? You bet. Cucumber lends a hydrating twist to this frozen concoction, while fresh mint leaves add a great-tasting herbal flavor that will counter even the harshest heat waves. Add vodka and lots of ice, and you won't even need to crank up the AC! Mix all ingredients together in your Margaritaville® Bali™ Frozen Concoction Maker® with Self Dispenser. Dispense into tall glasses garnished with a cucumber slice and a sprig of mint. With its high water content, watermelon is one of the most refreshing fruits around, and margaritas are a go-to when the temperatures start to climb. So it makes perfect sense that combining the two will create a frozen concoction perfect for hot-weather days. Mix all ingredients together in your Margaritaville® Bali™ Frozen Concoction Maker® with Self Dispenser. Dispense into margarita glasses rimmed with sugar and garnished with a watermelon wedge. 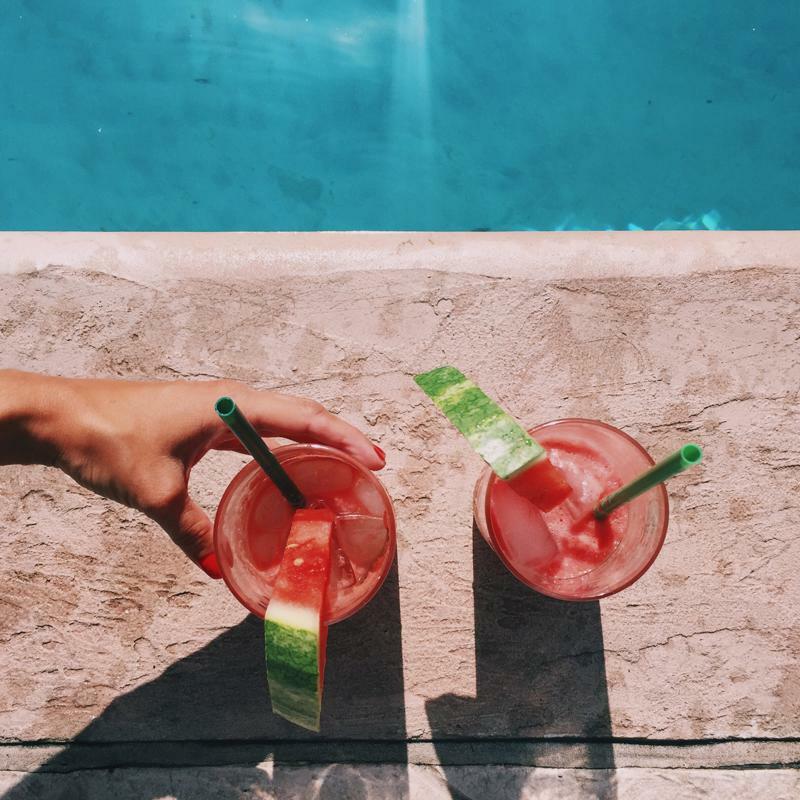 A refreshing watermelon frozen concoction will help you cool off on even the hottest of days. Ice cream is the ultimate hot-weather treat, so why not add it to your frozen concoctions? The result is a sweet, creamy and totally satisfying frozen concoction that will have you cooled off at the first sip. As an added bonus, you get to enjoy this delicious dessert without all the mess that comes with a melting ice cream cone! Mix together all ingredients with your Margaritaville® Bali™ Frozen Concoction Maker® with Self Dispenser. Dispense into tall glasses and garnish with a swirl of whipped cream, a cherry and - if you're feeling extra indulgent - a drizzle of hot fudge sauce! Looking for a sophisticated frozen concoction that will help guests cool off at your next get-together - or do you simply want a refreshing treat that you can enjoy poolside? Try this elegant gin chiller, that boasts just the right combination of fresh fruit flavors and fragrant herbs - all with a twist of honey, of course. Mix ingredients together in your Margaritaville® Bali™ Frozen Concoction Maker® with Self Dispenser. Provide tall glasses garnished with a strawberry and a few basil leaves so that you or your friends can help yourselves to this refreshing frozen concoction.